My name is Moye Thompson. My first name is always the most important to me because it’s distinctive and how I sign all my pieces. It's spelled M-o-y-e and it's my mother’s maiden name; people always ask. I am a ceramist. I used to be a potter, but I feel like as my work has expanded and I bring in more materials it's not just about functional items. I take the liberty to call myself a ceramicist and every now and then I'll call myself an artist. Its funny to me - to say you’re an artist is a very bold statement and I’ve always been intimidated by that. Somehow now if you label it art, it changes. The expectations are higher from you and from others. I trace this interest from my earliest days. I grew up in Atlanta, Georgia. My parents both came from farms, so I’ve always thought that this connection I have to the earth may come from that. When I was a young child we had a little creek in the back of our house and I remember going down and discovering that the dirt underneath the water was clay - you know, it was very clay like, with plasticity to it. It was so exciting; I found this thing that I didn’t even know was in our yard. In third grade my class went to Agnes Scott College, a women’s college, on a field trip for some reason. I remember getting lost somehow. I probably went into the bathroom or something and came out and suddenly everyone was gone. I was looking for my classmates and I wandered into the pottery studio. 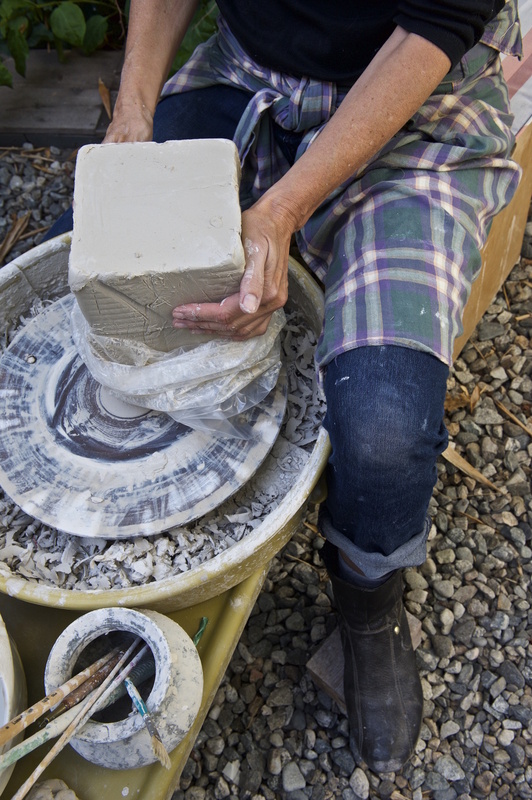 I remember seeing this woman turn this ball of clay into this big beautiful bowl - for me it was like magic. From that point on, just that accidental encounter, I realized what was possible with the clay I could find in my yard. I wanted to do it. In those days during holiday season there was a little toy pottery wheel advertized on television and I asked my parents if I could get it for Christmas, so they bought me one. If you’ve ever worked on a wheel you know it’s hard - but I sat there, my little third grade self, and I tried to make things on this wheel. It would look great as it was spinning around and then it would stop and it would be a slumping lump. But it was also a toy, so there wasn’t much strength in the toy itself. I took a pottery class in high school, in 10th grade, and I loved it. There is a very logical process as to how you take that lump and turn it into something else - it's like being an artisan in that it was just working on something, like carpentry, and learning the skill. There's something about it being very utilitarian, clay has been essentially used throughout history to make useful objects. I love that you are making something that you can use, your family can use, that people have a need for. It suits my personality that it's the art form I ended up gravitating to; I wanted to make something useful. And if it elevated itself, in my eyes or anyone else's, to something beautiful, then all the better. When I was living in New York I was working in a communal studio - that’s where I was taking lessons. Its called Earthworks, it’s still there. So that became my home. In that time, you work and you clean up. I cleaned up really well, I made sure there was not a touch of clay on anything I left for the next person coming after me. At some point I got a wheel for my kitchen in New York, in an apartment on 106th street, so that I could come home and work whenever I wanted, which was great. Then I realized ‘God, I don’t have to clean my wheel!’ because how stupid was it to spend all that time and effort cleaning when I was just going to sit down again and it was going to be me again facing this wheel. So I did get in the habit of not really cleaning up my wheel, because it seemed like a waste of time and water. In my studio now, I feel like I’m always working in it. 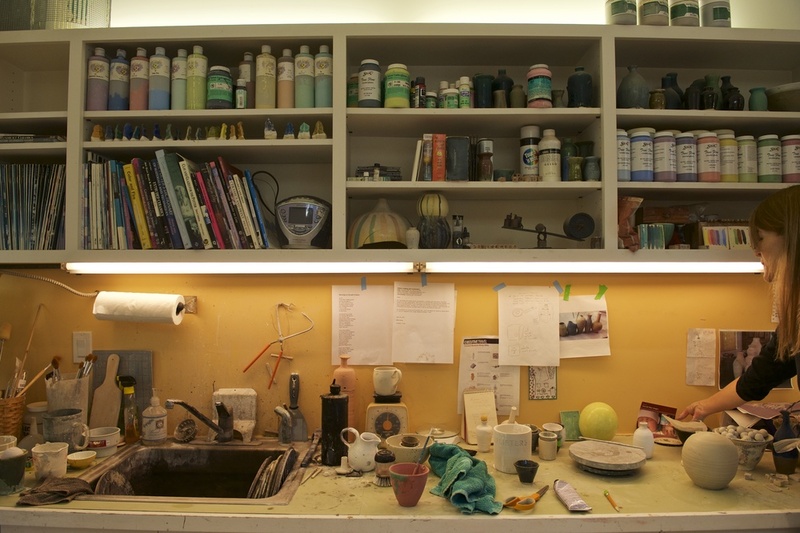 It gets so crazy in there, especially when I glaze - the glaze splatters and all over the place. But it’s a sign that it’s busy. I love making things, so I spend whatever time I can making things. And I don’t love cleaning, so I spend as little time as possible cleaning. I usually listen to stories. I'm a great reader - I love books, I love words. It's one of the little bonuses of this kind of work because I actually listen to audiobooks all day long, so I often get through four or five books in a week. For a while when I would make a piece and I wasn’t happy with it, I would just set it outside the studio and someone would take it. It was nice - the sidewalk traffic understood that that is free for the taking. Those pieces ended up in someone’s home and may be very valuable objects in those homes, where for me they were disappointments. That’s a lovely thing to see and to understand. As long as it works, if I make a functional piece and it works, then it’s a piece of value. The teacher who taught me and whom I loved, Martina, was a very precious person in my life. She was very natural and she just loved it, as I did, and I happened to randomly be assigned her as a teacher, and she was just a mentor to me, she was a wonderful person - sort of no nonsense - she loved what she did. I can still remember things she said to me, that I said to my students. I am part of this chain; the things I create will last long after I am dead, they will continue to exist in the world. The knowledge that I pass down, I trust, will be passed on to others. There is something beautiful about that - I don’t see myself as this fantastic artist but I am really just a student and a teacher. I am constantly learning from my own work, I occasionally go to workshops and actively learn but more often now I learn through my own mistakes. Ultimately, I am continuing this tradition that has existed for thousands of years. I love that it is an ancient art and that I am just another person in this continuum. 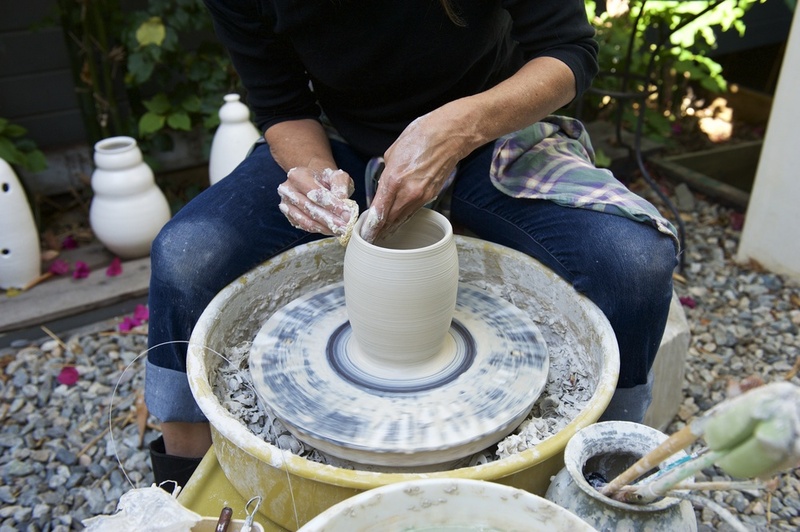 Are there any practices in your life that inform your ceramic practice? I love words; first and foremost I'm a writer. I subscribe to the Writer's Almanac, so every morning I get a poem. I'm always reading a new poem. There are some that are just beautiful, or hit me and feel so true or so sad. I love taking those poems and somehow incorporating them into my work so they have a life outside of a book. Just the idea of the symbol has so much power. With a rearrangement of letters you create words, with a rearrangement of words you create sentences and paragraphs and books. The day I realized that I can really bring that into my work is when everything opened up. In your portfolio, you distinguish between everyday works and gallery works. In what ways do the two differ? The designer who created my website was the one who labeled it. So when he showed me the first draft of the website, he had gallery art and then - rather than functional or whatever I might have said - he had everyday art. I love that he actually used the word art for both of them. I think that’s sort of a nice way to look at the world. If you let everything have that kind of value, then I think you give it a little place of honor in your life. 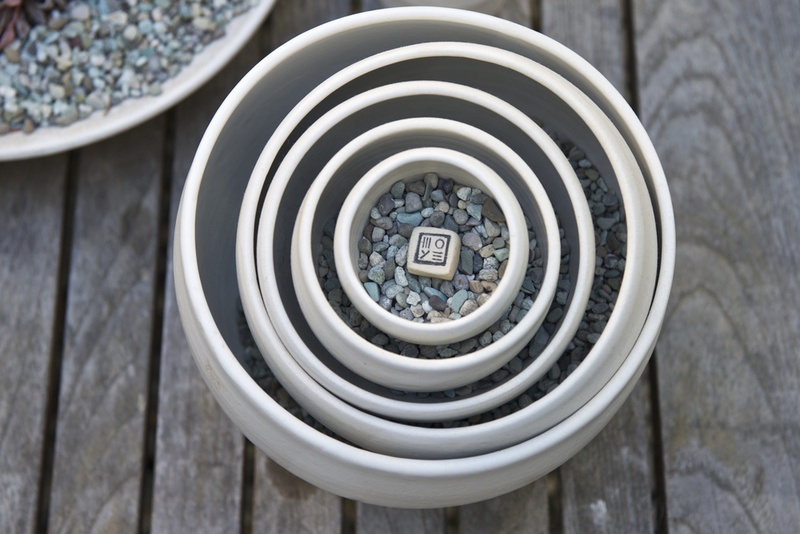 In Asia, certainly in Japan, there is this reverence for useful things, for pottery. 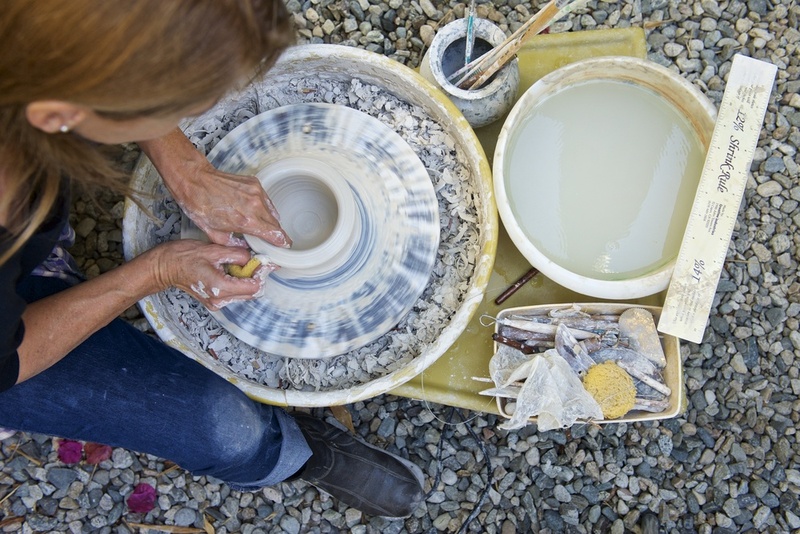 There are master potters, while here, clay arts are second tier. I don’t really know why that is but in part it is probably because they have long served a function and their traditional use has been as functional objects and therefore they are not given the same title of art. But I think that, for me, if you use it just adds to its value and beauty. For me, the most frustrating part is the glazing. While I can make pretty much whatever form I want to on the wheel - I have the experience and the time put in - the glazing is still up to the glaze gods. Whatever magic happens in there is sort of out of my control. That’s the frustrating part, especially when I am making a commission for somebody, because it’s also the final step. When I am making something specific for an individual, they have a specific idea of what they want and I have a certain idea of what I want - sometimes that’s not the same. But at least if it comes out of the kiln and the glaze works, I’m so relieved. But if it didn’t it’s very hard at that point to fix it. The whole commerce side of things is what I don’t like. To put a price on something for me is a very painful thing, I hate doing it. Why is this one more valuable than that one? I would prefer a piece be priceless - truly, no price. Because then it is whatever you want it to be. Once you put a price on it, it limits it somehow. 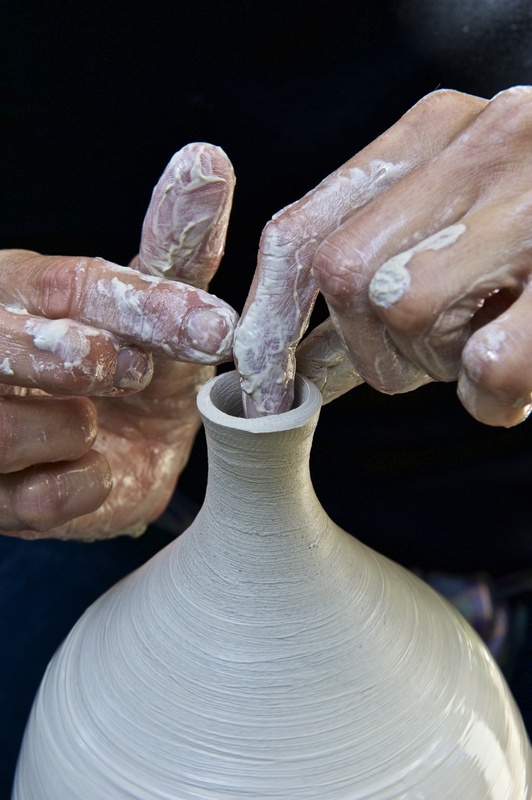 What has clay taught you? 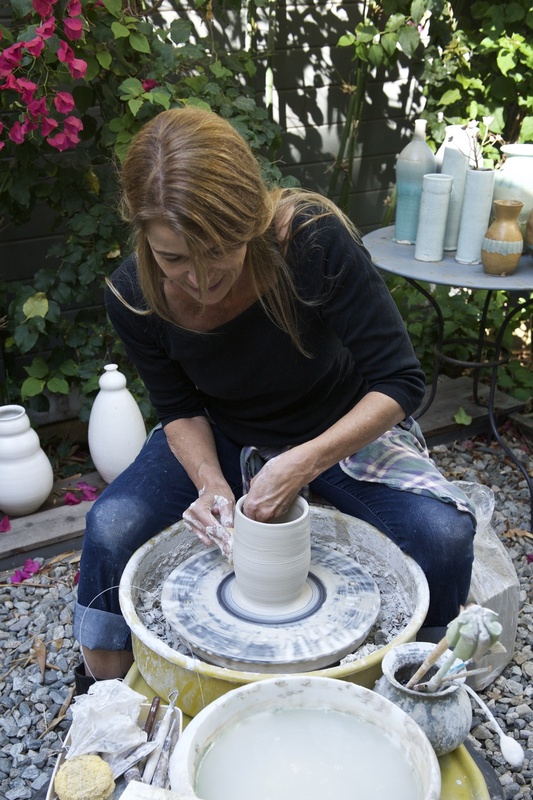 In the early days of my practice, I wanted my work to be perfect. You want that bowl to be perfectly symmetrical when it’s spinning around and you want it to look perfect when you stop it. What I have come to appreciate as I have gotten older and wiser is that it is the imperfections that can elevate a piece to the sublime. Yes, it’s great if you know technically how to do something, as Picasso did in perfect perspective. When you feel comfortable with that and you feel free to break away from it, why don’t you give it your own perspective? With pottery I’ve found that I got to a point that I appreciated the imperfection. I wouldn’t say I necessarily created the imperfection, but it is, by nature, going to be imperfect. You’re not going to make pieces that are exactly like one another, no matter how hard you try. It’s the great Japanese concept of Wabi Sabi that there is beauty in that imperfection. Now I try to celebrate that. I love the Wabi Sabi to a point, but it’s also frustrating - the nature of life - we can only control so much. It is better to accept the flaws and actually to find beauty in them and to understand that that in fact may be what elevates it from a strictly functional piece to something that someone will find beautiful. My hands are the most important thing to me. If anything happened to my hands I'm not sure what I would do. Sometimes they get a little achy, sometimes they get dry. 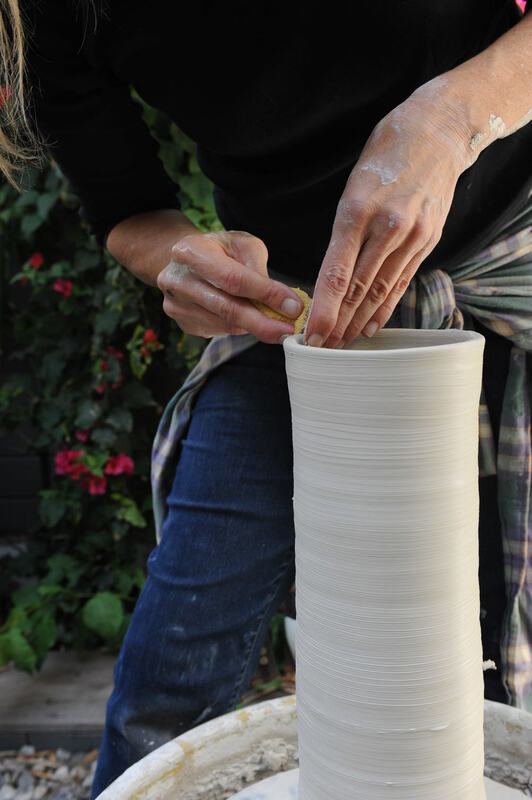 My hands are intrinsically strong and move well and know what they're doing; they're very sensitive to the clay and all the little distinctions in what's happening with the clay. What I do think about is how strong my arms are, because to center clay it takes a lot of upper body strength. It's not just my upper body - I'm working the pedal with my foot, which doesn't take strength, but my whole body is working. I like that it's manual labor. I like that at the end of the day, I feel like I've been working. It's a great feeling. To actually do something, to make something, to see something real accomplished. I turn off the light in the studio, turn back and see all of these pieces that are brand new to the world. They're going to exist in some form, even if they're shards they are going to exist forever. One of the things that I love about what I do is that I feel so physically alive. It's physically vibrant and robust, which is one of the side benefits. I love the manual labor; that it is of the hand. These simple digits can actually create anything. I need the kiln and my wheel, which are expensive initial investments, but when I'm sitting at the wheel it's a sponge, water, a pin tool and just my hands. It's just the hands, and I love that. So simple. Moye Thompson in Santa Monica, California on July 8, 2016. Photographs by Julia Girardoni.